Refurbished Alberg 30 with all new interior setee/ve-berth cushions, 25hp Vetus Mitsubishi diesel and custom highway trailer to take you anywhere, land or sea. Why sail to Florida and the Carribean, trailer this proven blue water cruiser to your destination for a fraction of the cost and time. No wide load permit required! This boat has a fresh marine survey performed when the boat was last taken out of the water for covered storage and winterization. Engine - N1190758 Vetus M3.10. Mitsubishi 3 Cylinder. 25HP. Fresh water cooled, inboard diesel. Less than 200 hours since installation. 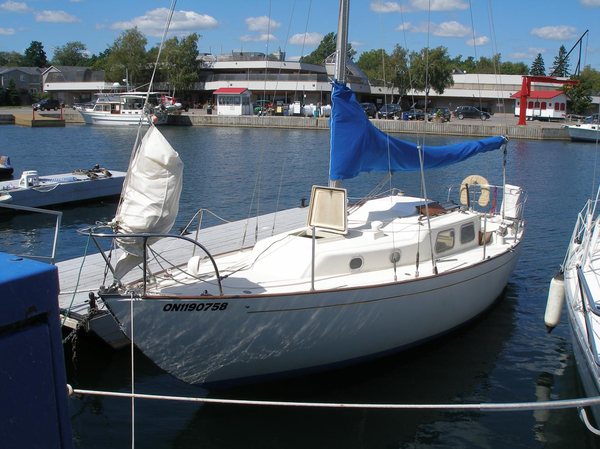 30 foot sailing sloop with single inboard engine.